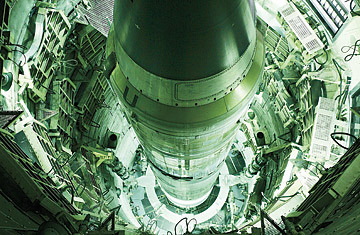 The New START treaty coming before the Senate reduces U.S. and Russian arsenals. But in light of current and potential threats, how many warheads does a superpower need? The sole remaining Titan II ICBM complex of the 54 originally used a nuclear deterents during the cold war is now a tourist attraction at the Titan Missile Museum, a national historic landmark, in Green Valley, Arizona seen in December. 2006. The missile carried a 9 megaton warhead and could reach its target in 30 minutes traveling at 17,000 miles per hour. This exercise is a bit absurd from the get-go. Would, or should, any American President initiate nuclear war, launching hundreds of nuclear missiles? (If we went second, there would be little point in attacking Russian missile silos; they'd likely be empty by the time our warheads arrived.) But let's accept the premise. The point is, it's very hard to devise a rationale for even as many as 1,000 nuclear weapons. Unless you happen to be the Strategic Command, or Stratcom (what SAC is now called). Officers there can always find a rationale for more weapons. As late as the 1990s, according to documents declassified at the request of Hans Kristensen, the director of the Nuclear Information Project at the Federation of American Scientists, Stratcom planned on firing an average of 20 warheads for every group of eight Russian targets. Kristensen infers from other documents and interviews that this is still the case. Stratcom reasons that this ratio is necessary to ensure that each weapon meets its required "probability of arrival." But what is this probability? Who came up with this requirement? Are this ratio and this requirement really necessary to deter nuclear war? Or, if nuclear war were to break out, would this ratio improve our chances of "winning," whatever that means? William Kaufmann, a pioneer of nuclear strategy who served as special assistant to every Secretary of Defense from 1961 to 1981, recalled years later, "It was easy to get caught up in the whole nuclear business. You could eat and breathe the stuff ... Then you'd move away from it for a while, look at it from a distance and think, God, that's a crazy world." The nuclear business is still like that. Those immersed in its cloistered corridors can easily recite the rationales for X number of weapons to hit Y number of targets with Z probability of success. But when they step outside, the blinders come off. Is anyone really going to fire hundreds or thousands of nuclear weapons, even if the math indicates that one side or the other has "superiority"? In the real world, a mere handful of nukes can upset those equations. In 1969 the Kremlin almost went to war with China over a border dispute, but it refrained because the Chinese had a handful of nukes that, if used, would wreak unacceptable damage. Today Washington worries that iran's rulers may be hard to contain if they develop a handful of nukes. Does it matter how many nuclear weapons a country has once it has any? This raises the question of whether the world might someday agree to eliminate these nightmare weapons. Obama has declared zero nukes only a long-term goal, to be reached, if at all, well past his presidency, probably his lifetime. As long as scientists know how to build them and nations have conflicting interests, those that have nuclear weapons aren't likely to give them all up, for fear that one of them will hide a few  or that some other nations will build a few of their own and thus gain instant "superpower" status. Obama has said that, as the U.S. and Russia continue to slash their arsenals, other nuclear nations might follow their example  and nations that once considered going nuclear might be encouraged to back off. Maybe. But the opposite is just as likely. At some point, when the major powers are down to, say, 100 or 50 or a dozen warheads, others might feel compelled to jump on the nuclear bandwagon, since even a small arsenal would put them in a position of parity with the big boys. For the time being, that day is a long way off. The New START Treaty requires both sides to make only modest cuts in their arsenals and no change in their policies. Opposition to the accord has little to do with its language and even less to do with military balance, strategic stability or the bizarre history of how we wandered into the nuclear maze  and how we might get out. Like arms treaties of an earlier era, the accord's main benefit is as a forum for cooperative diplomacy and, through its elaborate inspection procedures, a means for both sides to build  and verify  trust. Truly dramatic reductions in nuclear arsenals may have to be preceded by truly dramatic changes in world politics.